Wow! Time flies when you aren’t paying attention. The extreme weather during the past (Thank God!) winter really upset my winemaking schedule and put me behind in shepherding our second vintage of wines into the bottle. Instead of spending time in the winery working away, I found myself blowing and shoveling an awful lot of white stuff that refused to melt! But spring finally came and with it came a scramble to get everything ready. After I finally had a chance to catch my breath, I looked at the calendar and was dumbstruck to realize that our 1st year anniversary had arrived! In May 2014, we released our first wines to the world with the over-arching question of how would they be received. Well, I have been humbled by the response to our wines. So I’m extraordinarily pleased to announce that we’re not done yet! Our second vintage release is here and I’m thrilled to introduce some old favorites as well as a couple of new wines! 2014 Chardonnay, Massachusetts: A 100% unoaked version to highlight the fruit of this locally grown grape. Sur lie aging adds some creaminess to the crisp acidity, but the perfumed nose is the star! 2014 Rosé of Pinot Noir, Massachusetts: Crisp acidity, strawberries, white flowers, & an off-dry finish make this the perfect wine for summer picnics & beach days. Grab some goat cheese & crackers and head for poolside! 2013 Malbec “Two Valleys”: BRAND NEW WINE. We headed south to source our malbec from two of Chile’s premier winegrowing regions. A blend of malbec from the Curico and Colchagua Valleys with a small amount of cabernet sauvignon & petite verdot for additional complexity. Perfect with those BBQ ribs, grilled lamb, or hamburgers. 2013 Merrimac Red: BRAND NEW WINE. This is our version of a classic Right Bank Bourdeaux blend of merlot and cabernet franc with our twist of added petite verdot. 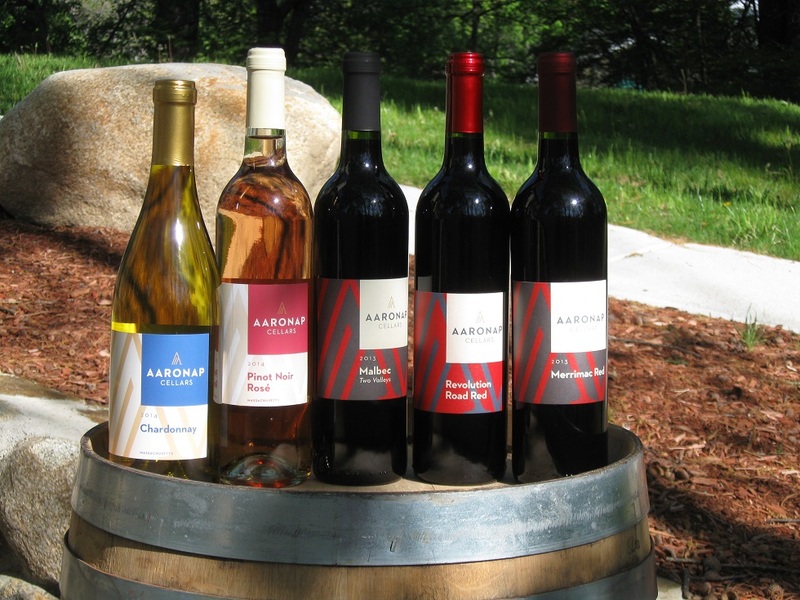 How convenient is it that Aaronap Cellars sits on the right bank of the Merrimack River? Lush blackberries, cassis, black cherry, and raspberries dominate the nose with subtle vanila undertones. Silky smooth tannins caress the palate and linger on the finish. Pair with grilled steak, stuffed mushrooms, or roast pork. 2013 Revolution Road Red: 2013 was even warmer in New England, so this premium blend of merlot and cabernet franc grown in Rhode Island is even lusher and darker than the 2012 that you loved. Aromas of black cherries, blueberries, & raspberry with hints of mint & truffle. Well-structured on the palate with the final taste of cranberries on the lingering finish. Forest Gold Maple Wine: A crowd favorite returns! Our second batch is just as good as the first with lush aromas of brown sugar, clove, nutmeg, almond, and maple. Break out the ice cream and a glass! These wines will be available throughout the summer at a farmers market near you. We’ll also be making a broader push into retail stores this summer, so stay tuned for those announcements! And stay tuned for the fall releases. 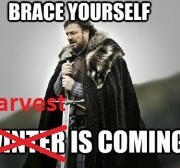 We’ll have a couple of new wines that will be just right for the cooler fall and winter weather. I won’t give any more hints…you’ll just have to wait to see what is coming! The grapes are coming, the grapes are coming! The Making of Maple…..Wine!